Technology is constantly evolving. As you are reading this piece of writing, companies are working hard at replacing the current technologies we currently have to make everyone’s lives better. Faster computers, better home appliances and more efficient machinery are just a few examples. However, there are repercussions to better technology. Old gadgets get scrapped and they make a ton of trash. Remember those old CRT monitors everyone used to have back in the 90’s? Where are they now? Honestly, we don’t know. All we know is that they’re gone, and LCD monitors are here to stay. Where do all of these obsolete gadgets go to anyway? Well, they often end up in landfills or special recycling centers. Most commonly, they ship to Third World countries for smelting. Circuit boards are normally melted to get the precious minerals, such as copper, lead and silver. All of these obsolete gadgets, as readers of Sustainablog know, are e-waste. Around the world, e-waste is a problem. For example, the United States is the biggest producer of e-waste. It is estimated that they produce three million tons of e-waste every year. These include cell phones, computers, appliances and other gadgets using electricity. The second biggest producer of e-waste is China. Every year, they produce about 2.3 million tons. Aside from that, they also receive tons of e-waste from other countries. They are imported due to the valuable minerals and spare parts that can be salvaged. In fact, China’s city of Guiyu in the Shantou region is dubbed as the capital for e-waste landfill. The city employs more than a hundred thousand workers for recycling e-waste. Since the U.S.A. is the biggest producer of e-waste in the world, let’s look at some figures and imagine how much trash is created in electronics alone. 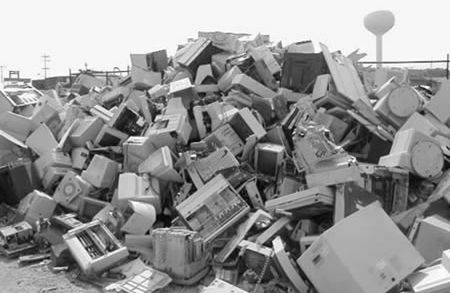 The Environmental Protection Agency reports that in 2007, at least 29.9 million desktop computers and 12 million laptops were discarded. Aside from that, 31.9 million computer monitors were discarded. Other kinds of e-waste number up to 400 million units. Also, 500 million units of consumer electronics were sold in 2008. The average U.S. household spends at least 1407 dollars per year for computer hardware. Where can E-Waste be Found Now? One of the first places you’ll find e-waste is in the homes of people. While not exactly discarded, electronics that aren’t used anymore can be considered e-waste. In fact, e-waste accounts for five percent of municipal waste worldwide. Another place you’ll find e-waste is in landfills. It accounts for 2 percent, but it is 70 percent more dangerous due to the hazardous chemicals found in the circuitry. On odd place where you’ll find e-waste is outer space. Yes, there’s also plenty of trash in outer space from the past missions of NASA and other space administrations around the world. You’ll find them orbiting the Earth, but most of them are very small. One easy way to help curb the increasing problem of e-waste is to properly dispose of it. Many people simply throw their old gadgets in the trash, which directly goes to landfills. Instead, people can send their e-waste to the proper recycling plants. This allows the substances in the circuitry recycled properly, and that it doesn’t damage the environment. You can also sell your old electronics to people willing to buy them. Just make sure they’re in good working condition, such as TV’s. You can also donate them to charities, where they will be given to the less fortunate. Guest post by Mikaela Taylor.